It’s been about a month since I signed up for a bunch of micro-blogging websites. So what do I think after about a month? Let me start off with Twitter. In my first look at the micro-blogs I had some pretty good feelings about Twitter. That has basically carried over for the past few weeks. 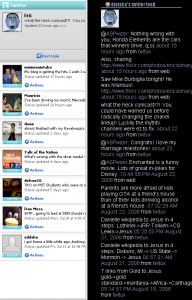 I added a Twitter plugin to my blog, using it for quick thoughts I don’t want to elaborate on with a blog post. 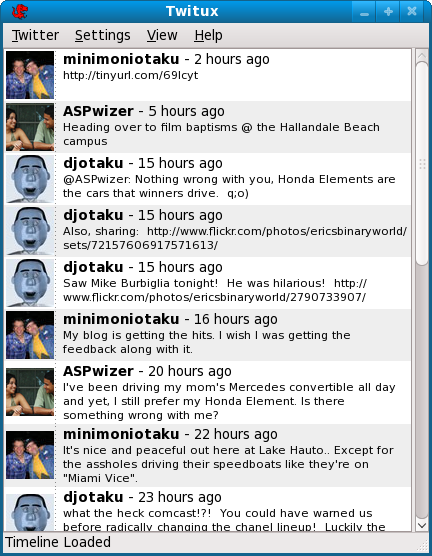 I’m also using Twitux on my Linux computer for posting without having to load up the Twitter site. I haven’t really been using the Flock Twitter plugin because it doesn’t seem to update correctly or often enough. I’m enjoying using it for those quick thoughts. I’m definitely going to keep using Twitter for the foreseeable future. So I feel the way about Twitter as I did a month ago – I like it. Now onto Pownce. I have barely used Pownce. I’ve made perhaps somewhere between 15 and 20 posts and that’s about it. I think part of the problem is that everyone I know is on Twitter or will be on Twitter in the near future, but no one I know or care about is on Pownce. I mean, even NPR’s Talk of the Nation is on Twitter. 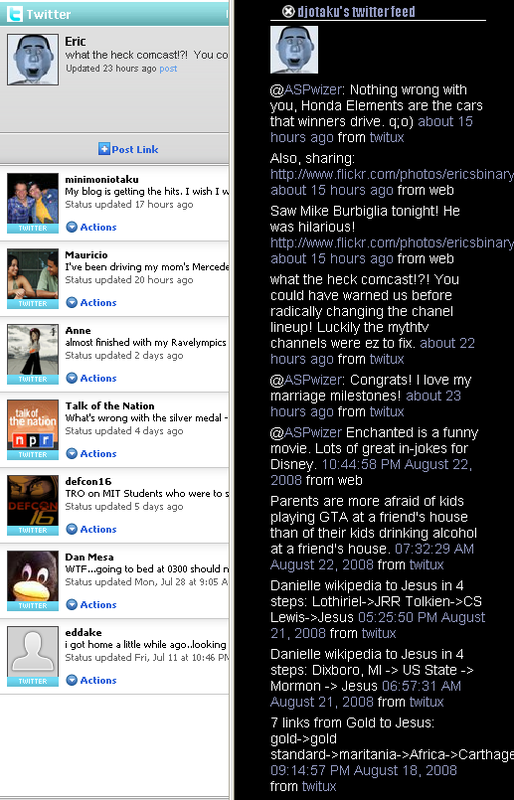 The reply feature is nice, but so far I haven’t been able to use it since no one is following me on Pownce. I haven’t had a chance to use the fileshare or calendar features I was excited about in my review a month ago since I don’t know anyone on this service. I may keep updating it for a little while, but if that account lapsed and they canceled my account, I wouldn’t care. 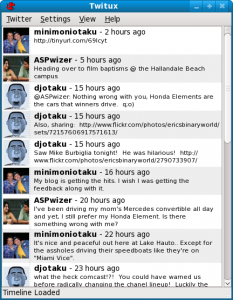 I’m also using a WordPress Plugin for Pownce and it looks exactly like the one for Twitter. Just like a month ago, I am not that fond of Pownce. Finally, onto Plurk. I think Plurk was the Internet addiction I was quickest to get over. Previous addictions include Facebook and Flickr. I have met a lot of people on Plurk that seem to be pretty neat people to talk to. There’s also a huge knitting in the Plurk constituency. At least, everyone I click on from the “interesting plurkers” links appears to be into knitting. It’s a pointless fact, but a strange one. Plurk was a very interesting ride when compared to last month’s review. The action items in Plurk turned out not to bother me that much and I eventually came to like them and tried to always format my answer in the third person. And, there was the option to pick a blank option and just put whatever you wanted in there. So instead of annoying me, it ended up forcing me to be creative. I didn’t like that there was only a line for typing – but the line dynamically becomes a box if you type more in. I was also excited about the karma. So, interesting, the karma did what it was supposed to do at first – get me to come back and do lots of commenting on other people’s plurks. It also got me to befriend a bunch of people. But then the karma ended up getting me more and more pissed off. Now I’m at the point where the karma is actually what is causing me to consider just getting rid of Plurk. I absolutely had the feeling that I’m being forced to Plurk. I’ve never liked people forcing me to do things and I’ve always left any organization where I had to be forced to do something. The most annoying part is they expect you to plurk from work instead of actually working. At a lot of jobs, like mine, this is against the computer policy and people have been fired over it. So every day when I got home, my karma had gone lowered. This was made even more annoying by the fact that you get more abilities on the site as you get more karma. Also, if the others are right, then by not using smilies and dancing bananas, I’m limiting my karmic growth. I don’t want to be forced to use smilies if I don’t feel like it. Also, as more and more people did more and more plurking, it became harder to keep up if I took some time off to spend with my family or others in the real world. I would come back and find hundreds of plurks for me to look over. If I don’t look them over, it’s hard for me to find replies to my most recent plurks. So they need to somehow fix that – I can’t think of the best way to do it right now, but it certainly doesn’t work well. People are constantly claiming plurk bankruptcy. Also, when I’m skipping through these hundreds of plurks it makes me feel bad that I’m not reading what others are saying, but I expect them to read my plurks and respond so we can have a conversation. So, in the end, I really enjoy Twitter – the original. Pownce is just there and I haven’t found a compelling reason to stay with it. Plurk has annoyed me so much with the karma and bad reply interface that I’m thinking of quitting it. I’ve been purposely boycotting it for the past 48+ hours and just spending time in the real world instead of the 20+ minutes it’s going to take me to get through all the replies. I may go back to Plurk, but I’d probably just end up ignoring the karma.